This step by step lesson explains and illustrates the technique used to paint the vase from our Still Life Painting lesson. By following the illustrated stages below we lead you through the key points of its painting technique from the flat underpainting of its shape to the finished details of its lustrous glaze. Before you start painting any still life object, it is best to paint its background first. Underpaint the background and foreground with flat colors. 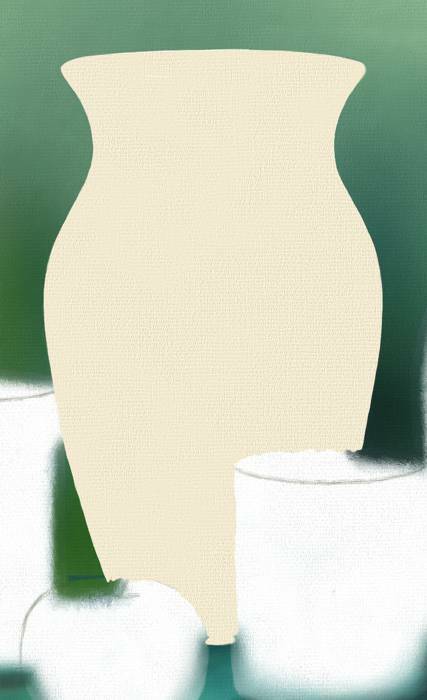 Start by underpainting in the shape of the vase with a flat area of opaque color, taking care to establish its outline as accurately as possible. Apply the first layers of dark tone using thin glazes of transparent color. Apply the first layers of dark tone using thin glazes of transparent color, softly blended with a sable brush. The aim at this stage is to establish the basic form of the vase by carefully building up its graduated areas of tone. Apply the decorative band with a flat transparent glaze of green. 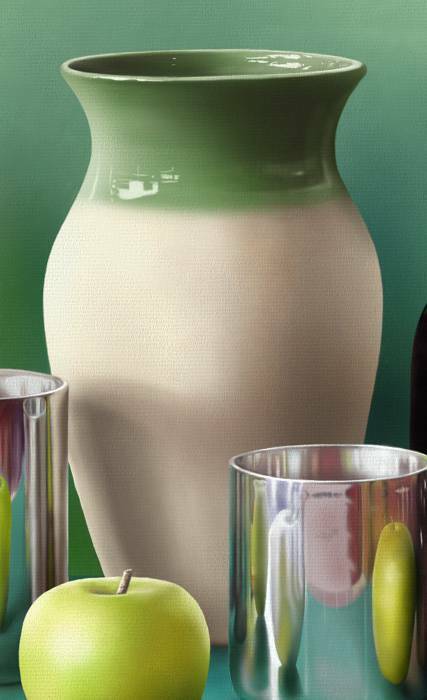 The band of color around the neck of the vase is applied in a flat transparent glaze of green. Some of the tonal contrast of the vase is lost beneath this green glaze. Rebalance the tonal contrast of the vase. At this stage we reestablish the tonal contrast of the vase with a further application of dark tones. Build up the light tones of the vase with thin glazes of white. 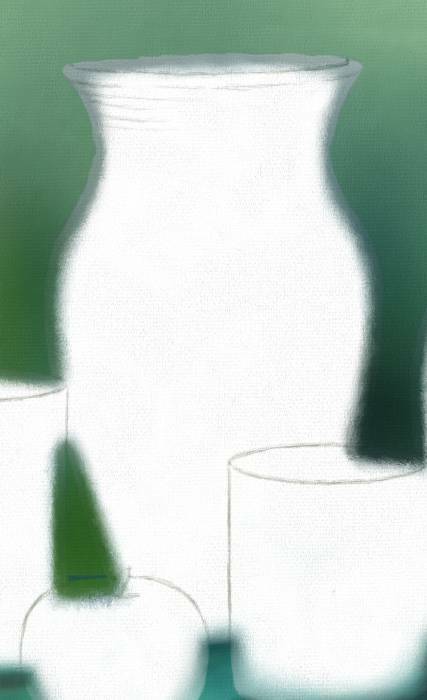 Next, we build up the light tones of the vase with thin transparent glazes of white, carefully graduating and blending them with a soft sable brush. The aim here is to create a natural balance between the dark and light tones of the vase. Apply a range of highlights. Finally, we apply a range of highlights using both transparent and opaque glazes of white to suggest its lustrous surface. Painting of the vase in context. The accuracy of your observations is confirmed when you see the finished vase in the context of the other still life objects. Still Life: Painting a vase. Step 2: Underpaint the shape of the vase with a flat area of color. Step 3: Apply the first layers of dark tone using thin glazes of color. Step 4: Apply the decorative band with a transparent glaze of green. 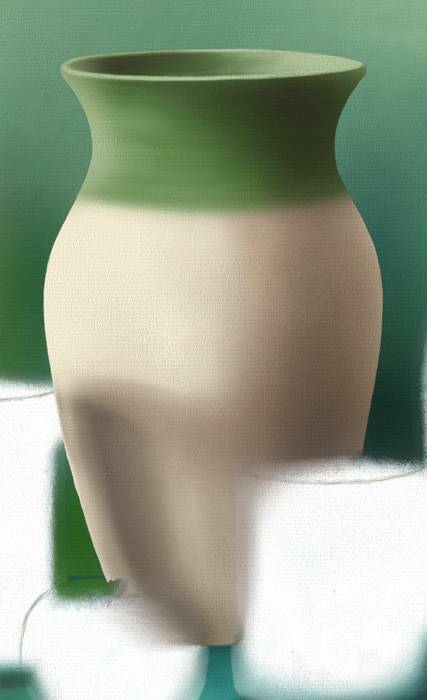 Step 5: Rebalance the tonal contrast of the vase. Step 6: Build up the light tones of the vase with thin glazes of white. Step 7: Apply a range of highlights. This still life slide show illustrates the step by step process of painting a vase.